Once upon a time there lived an old crane near a pond. The crane was very old that it couldn't catch fishes by itself as it used to do when it was a young. He started starving for food. So the old crane thought about a plan to get food. He went and stood still near the pond keeping his face very sad. A crab from inside the pond saw the crane and asked why he was looking so sad.The crane said, "Dear friend, as you know I have been living happily near this pond for many years. But for the past few months I am feeling that the water is drying up in this pond. That is why I am very sad." Believing the words of the crane, even the crab thought that the water was drying up in the pond. He too felt very sad and said this to his fish friend. Very soon the news about water drying up spread quickly to every fishes in the pond. All of them became very sad. The crane was actually waiting for a moment like this. The next day, when he saw the crab and few fishes he said, "Dear friends, don't worry. There is another pond in little distance from here. There is plenty of water in that pond. If we move to that pond, we all can live very happily for many years in that." The fishes and the crab were excited to hear about the other pond. But they asked how could they move to that pond. The crane replied, "Ah.. I can help you in that. One or two of you can get into my beak. Then I will take and leave them in that pond. But I am very old, so I will be able to take only 2 fishes in one day." The fishes were very happy and thanked the crane for this idea. So as the crane instructed each day two fishes would get inside his beak. Poor fishes didn't know about the crane's wicked plan. Actually the crane didn't take the fishes to the pond. Instead he went behind a rock near that pond and ate those fishes. This continued for several days. One day when the crane came to take two fishes, the crane asked, "Hello friend, why are you taking only the fishes? When will you take me to that new pond?" The crane felt happy that it is going to have a different food that day. 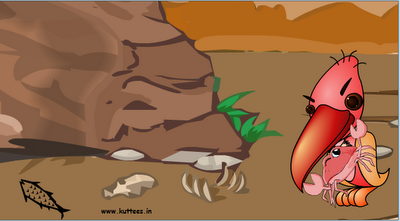 As usual he picked up the crab in its jaws and went behind the rock. There the crab saw the bones of fishes scattered all over. 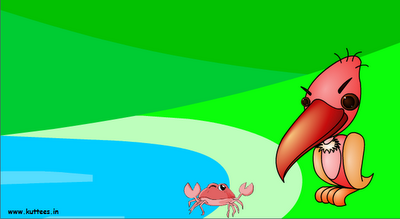 The crab realized the evil plan of the crane and felt very sorry for the dead fishes. When the crane tried to bite the crab, the crab caught the crane's neck very tightly and killed him. He then came back to the pond and told the fishes about the trick played by that old crane. MORAL: One cannot keep cheating for ever. The truth will come out one day.